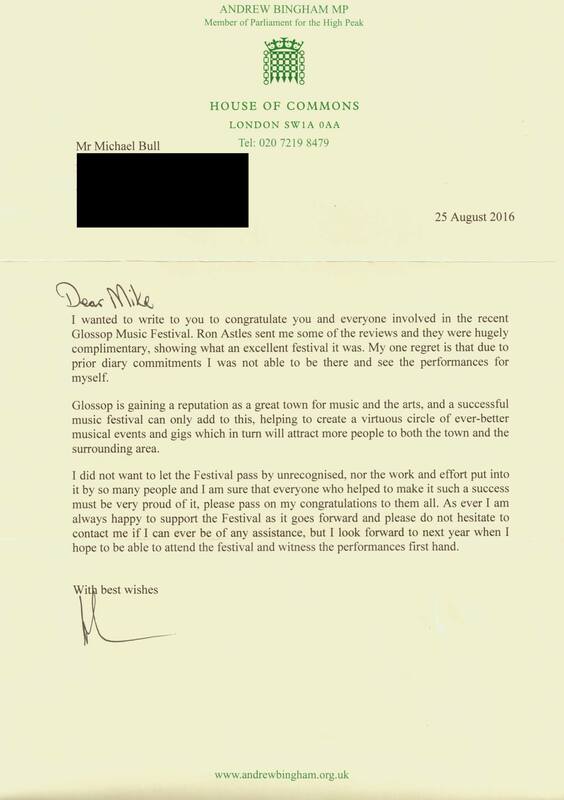 “I wanted to congratulate you and everyone involved in the recent Glossop Music Festival. Ron Astles sent me some of the reviews and they were hugely complimentary, showing what an excellent festival it was. My one regret is that due to prior diary commitments I was not able to be there and see the performances for myself. Glossop is gaining a reputation as a great town for music and the arts, and a successful music festival can only add to this, helping to create a virtuous circle of ever-better musical events and gigs which in turn will attract more people to both the town and the surrounding area. You can view the letter in full by clicking here.